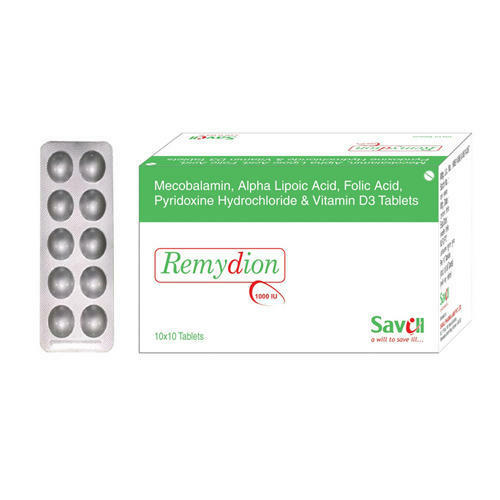 We are one of the most eminent names in the market engaged in offering Alpha Lopic Acid 100mg,Pyridoxine HCL 3mg, Methylcobalamin 1500mcg, Folic Acid 1.5mg, Vitamin D3 1000 IU tablets known by the Brand Name of Remydion. The products supplied by us are formulated using quality ingredients as per international quality standard system. These are checked upon certain well-defined parameters to gauge its flawlessness before we make them deliverable in the market.It is available in Alu-Alu strip pack with each box containing 10 strips in excellent Drip off Pack. We, Regal Sales Agencies, established our presence in the business of manufacturing, exporting, supplying, wholesaling, and trading Generic Pharmaceutical Medicines in the year 1993. We bring forward several types of medicines, processed using pure ingredients and hygienic methods, including Pharmaceutical Drugs, Antibiotics Medicines and Anti Spasmodics Drugs. Our offered medicines have gained worldwide recognition as we formulate them using premium quality ingredients and latest pharmaceutical equipment. Our offered range is ensured for qualitative and pure composition and effective results, owing credit to our ultra-modern infrastructure and team of personnel having years of experience in the pharmaceutical industry. We develop our offerings as per the global standards, so that the quality standards are maintained as per the set industry norms. Although, we started our journey with small steps, but backed by in-depth knowledge of our specialists and coordinated organizational structure, we have been able to set a benchmark among our competitors.